I'm very excited for my first show in Taipei! 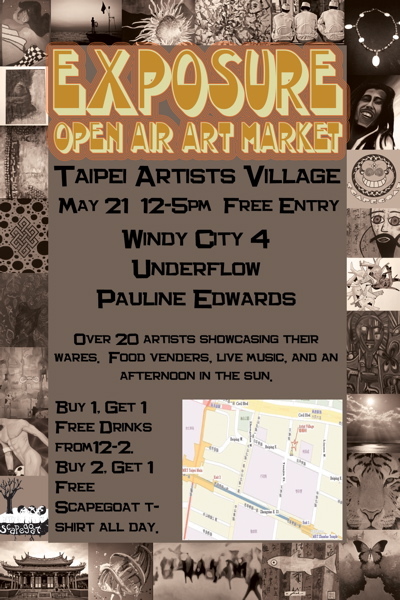 Coming on on Saturday, May 21st at the Taipei Artist Village. If you're in the area, come check it out - free from 12pm-5pm! I'll be doing a solo set of original songs starting at 2:30pm. We are playing at the Black Stilt Coffee Lounge on Saturday, January 8th. This will also be my last show in Victoria before heading to Taiwan to live the tropical life. We're gonna be playing two full sets, including one new cover song from the Pixies, two new originals (one with violin) and a couple classics off my very first home-recording project CatchingUP, for good old times' sake. I do hope you can make it! Ask me for details on the afterparty! PS>>regrettably, the Black Stilt was recently bought out by the Mocha House, and *will no longer be serving alcohol*. Time to christen that new flask?? Finally have the new promo pictures up on the promo page! Check it out yo! A couple pictures from the show at Lucky Bar in April are there along with some other new ones. I'd like to officially welcome Fraser MacGillivray as the new bassist for the band! Fraser plays a 6-string fretless Larrivee with a 250w two-ten combo bass amp (Hartke 2510) and a Tech 21 SansAmp Bass Driver programmable DI box/amp modeller. Our next show is at Lucky Bar on May 11th with Isobel Trigger, Cole Grifter and As the Crow Flies. It's gonna be awesome! I've got 20 advance tickets to sell. They're just $8 each, so let me know if you want one! ON SALE NOW!!! 'Exchanges With Self and Others' is now available! We launched the book at Solstice Cafe on Friday and celebrated with a great audience and guest artist Jean-Paul de Roover from Thunder Bay Ontario! It was a great night, thanks so much to everyone for coming out and showing your support! Get your copy by clicking the box below, or find it on the poetry page! If you're in Victoria and you didn't get a chance to come by the Solstice show, come down and pick up a copy at the Ocean Island Lounge tonight! I'll be there performing from 9pm to midnight! My new poetry book 'Exchanges With Self and Others' will be available starting November 20th, 2009! Check out the poetry page for a sneak peek! My blog doesn't seem to be working properly right now on this site, but you can still keep up with the latest on my myspace page, which is where this one is pulled from. Hope to get it all working properly soon! The Official Music Video for Pampas Grass is now up on YouTube, Myspace and Facebook! Directed by Andrew Marchand and shot right here in Victoria, BC! Tell your friends!! Well, I'm back on the island (Vancouver Island) and it's good to be home!! Check out my blog to read about the East Coast road trip, and shows in Ontario. I'm excited to report that 'There Comes A Time' received its first radio play today! CBC's Victoria station 90.5 played it on their morning show 'On The Island' hosted by Gregor Craigie. Thanks to Greg for playing Devil's Eyes, the first track off the album!! My new album 'There comes a time' is now available at CD Baby. Check out my page where you can buy the album, or get the digital download! I'm filming a music video with Andrew Marchand directing. We start filming this Saturday! Check out my myspace page for some violin gig dates at Sips Bistro in James Bay, Victoria. I'll be posting some Ontario dates soon too, so check back for those! And...Spring has finally sprung on the island! That's it for now. Thanks again to everyone who came out to the CD Release! Let me know what you think of the album! Ok, the CD release is booked for April 18th at the Fort Street Cafe. It's gonna be a great night because in addition to moi, you're gonna get to hear Tom Glenne rockin out, AND if all goes according to plan, we're gonna be screening a special little video as well. Great news! The album is finished being recorded! I'm SO very excited about how it turned out. I think it sounds great and I can't wait for everyone to hear it! The CD release is in the works...lots of planning to do. Expect a party!!! Should be in early April-I'll keep you posted. Great News! I got a $500 recording grant from the Fernwood NRG via the Cornerstone Collective Records' new award, the Bert Grant. Other recipiants of this award are: Thomas P. Radcliff, Charlene Birbeck of Char and the Broadleaf Killers, and Maureen Washington. Congratulations you guys! I'm very happy to announce that I will be going into the studio next week to start work on my next album. I will be recording with Eric Hogg in Victoria. Eric is one of Victoria's most talented up and coming music producers, and I feel very lucky to be working with him. It's the Cornerstone Collective's first birthday! Come out and celebrate with us at Hermann's Jazz Club next Saturday, October 18th. A bunch of us from the Collective will be performing, and I'm up first at 8pm, so don't be late! Tix are $10 at the door. Thanks to everyone who auditioned for the band. The final line up is now complete. Please come check out our first show at Detour on August 21st, opening up for the James Kasper Band. I'm looking for a drummer, bass player and lead guitarist to help me record my next album and to do some local live shows when it's done. Drop me a line if you are interested in talking more about it.